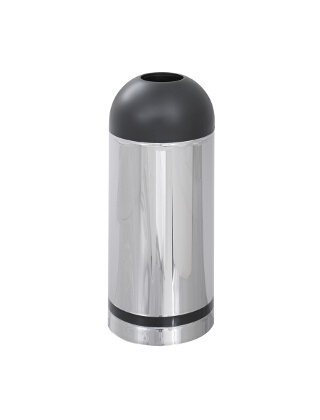 The ideal open top receptacle for areas where sanitary, hands-off disposal is desired. Classic "torpedo" design with 6" open top for drop-in convenience. Constructed with the highest quality, puncture-resistant, fire-safe steel with rolled rim and double lock seams. Recommended for indoor use only. Holds 15-gallons. Reflective Chrome finish with Black accents.